Towards the end of last year I wrote my first book – with the working title “Who says you’re not creative”. In my work as a Creative Facilitator, I come across lots of people who label themselves as ‘un-creative’ which I am not even sure is a word! My book is a response to all those people. We are all creative. We’ve just got a little disconnected from our right brain/ our capacity for creativity. This book is an accessible insight into creativity which aims to help people re-connect to their natural/ inherent creativity. It’s currently in the process of being published but I wanted to start releasing it into the world anyway. Comments are most welcome but only constructive ones please. There is enough negativity in the world. (I borrow this approach from the wonderful Richard Wilkins who said something similar at the end of one of his talks last year – it made many of us chuckle). It would be great to foster creative conversations on here and find out what you think of the sections I publish. If they resonate with you I’d love to hear about it. P.S. If you want to know a little more about my work as a Creative Facilitator here’s the link to my main website http://www.thecreativethinkingcompany.co.uk. Section 1: Where are we now? We live in a society that places greater value on rational logical thought rather than creativity. We can see quite clearly how the western education system places science and maths above the arts and humanities. You only have to think back to your time at school and the pressure to choose certain ‘academic’ subjects that would be more likely to help you get a good job in later life. Those good jobs being: medicine, accountancy, teaching not artists, dancers or writers. Many people talk of this split in terms of the left and right side of the brain where the left side houses logical, rational, analytic processes and the right: images, sound, imagination, colour. This split is metaphorical rather than the way the brain is actually structured which is far more complex. It does however provide a useful shorthand for different ways of thinking. The value difference between left and right brain thinking can perhaps be attributed to a belief that the more academic disciplines would contribute to building a more wealthy and successful society. This may have served us well up until now. Now we find ourselves in a recession, which many say was predictable and is here for the next 5 years. Might our reliance on logical rational thought let us down? Would now be a good time to embrace the right side of the brain? Unfortunately due to the left brain bias, we need to re learn how to use all those wonderful things of the right brain like our imagination, playing with the impossible and nonsensical, the use of metaphors, images and lateral thinking. Fortunately we can re-learn. So interesting Prith! Creativity is so undervalued but probably because it is misunderstood? What do you think of Ken Robinson’s take on it? I’ve only listened to one of his talks but it was really inspiring. I think you are such a fabulous role model to be guiding people through these ideas. I can’t wait to see more! Thanks for your response and opening up the conversation from New Zealand and taking us global! Yes Ken Robinson is a hero of mine. Is it the Ted Talk? Link below for people who haven’t seen it. His book “The Element” is also a good read. The ideas in my book will be an amalgamation of everything I’ve read and the talks I’ve been to- so I am not professing to be the originator of the ideas/ concepts in the book. Although- I have sneaked in a few of my own thoughts which I haven’t read else where, but the world is a big place so maybe someone else has thought of them too. I was thinking of releasing a section a month- or maybe every two weeks. Let’s see how it goes. I hope you contribute your ideas about creativity along the way being the talented photographer, designer that you are! Thanks for posting and for introducing the idea of different intelligences. I’m thinking you know/ are referring to the work of Howard Gardner and his theory of seven intelligences. Linguistic intelligence- sensitivity to spoken and written language, the ability to learn languages. Writers, poets, lawyers and speakers are among those that Howard Gardner sees as having high linguistic intelligence. Logical-mathematical intelligence: the capacity to analyze problems logically, carry out mathematical operations, and investigate issues scientifically. Musical intelligence involves skill in the performance, composition, and appreciation of musical patterns. Bodily-kinesthetic intelligence: this is essentially about expressing yours elf through movement. Spatial intelligence: Ability visualise space and how to use it. Interpersonal intelligence: capacity to understand the people: Educators, salespeople, religious and political leaders and counsellors all need a well-developed interpersonal intelligence. Intrapersonal intelligence: about an understanding oneself. First of all I would agree with you that the sciences are/ can be creative. There are several definitions of creativity – one of my favorites being ‘Creativity is inventing, experimenting, growing, taking risks, breaking rules, making mistakes and having fun” Mary L Cook. This definition would thus apply to the sciences (some of them anyway). The other idea you might like, and may help answer your questions is this one from T Amabile. She says creativity and innovation happen when you have 3 distinct elements: Technical expertise, creative thinking and motivation. So creative thinking alone will not bring about innovation- you have to know the subject matter too. As you know, my work is about providing creative thinking skills to people in all sorts of organisations. Often I have very little understanding of the detail of their work, as you know from my work at Arup. My role is simply to teach the skills of creativity and show how they might apply to their work. So again you are right- you do need that technical expertise. This first piece did not intend to say the sciences were not creative- just that society places greater value on academic subjects, which may be considered to be more left brained activities, rather than the arts, which are predominantly more right brained activities. (Left brain = linear, logical thinking, lists, words, numbers. 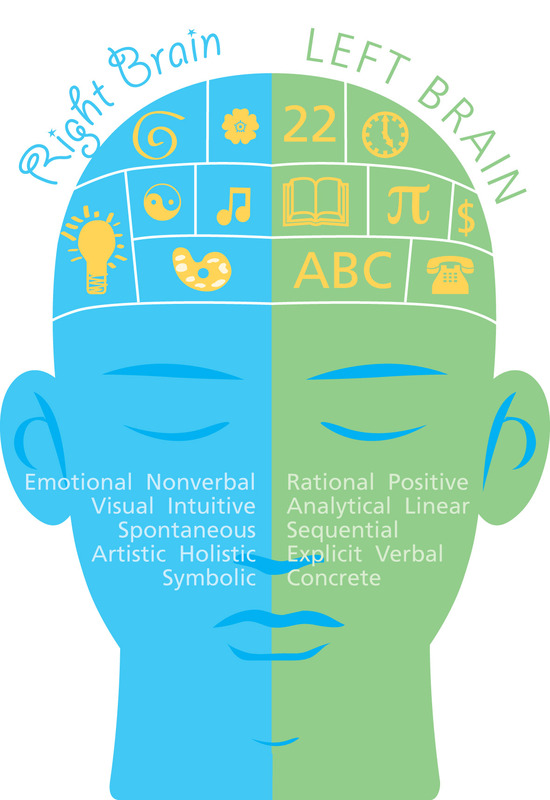 Right brain = colour, rhythm, imagination, space, abstract thinking. Once again this is a simplification of the workings of the brain- it is more complex). In terms of the HBR post and the two personality types: promotion focused and prevention focused dominant styles of thinking. The first sounds like right brain and the latter left brain. In business you do need both. Early on its all about being promotion focused- seeing the opportunity, taking the risk to begin. But for growth and sustainability you need the prevention focused types. Some entrepreneurs are blessed with both but the majority of businesses need different people to bring about this balance. I think that people in any discipline can be creative. It’s all about the individual person, their approach to their work and how they see things. A culture and line manager that favours creativity is also a must, otherwise the creative spirit can be stifled and replaced by disillusionment and de-motivation. The other key thing for me is that if you’re not a ‘natural innovator’ you can learn how to become one. I hope I have sufficiently addressed your comment. There was a lot in there! Thanks for such a detailed response Prith, you know your stuff!